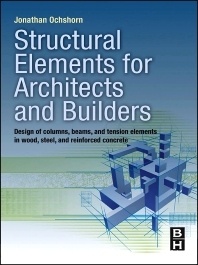 Concise but comprehensive, Structural Elements for Architects and Builders is primarily focused on the design and analysis of structural elements: columns, beams, tension members and their connections. The material is organized into a single, self-sufficient volume, including all necessary data for the preliminary design and analysis of these structural elements in wood, steel, and reinforced concrete. Every chapter contains insights developed by the author and generally not found elsewhere. Additionally, the Appendices included at the end of the text contain numerous tables and graphs, based on material contained in industry publications, but reorganized and formatted especially for this text to improve clarity and simplicity, without sacrificing comprehensiveness. Ch.1 is a concise introduction to (or review of) statics.